For those that love blackberries, we are featuring a new blackberry with a bonus song from Dr. John Clark, and a new “snappy” apple cultivar from Cornell University. If you have any questions about these new varieties, please send us a note! What makes ‘Prime-Ark® Traveler’ special? ‘Prime-Ark® Traveler’ is the world’s first commercial, shipping quality, thornless and primocane-fruiting blackberry cultivar. The primocane-fruiting attribute, which allows production on current-season canes (see Jewels in the Genome article), will broaden options for season of production and management strategies in world blackberry production. When was the cross made? The cross was made in 2004 at the University of Arkansas Fruit Research Station, Clarksville, Arkansas. What is the pedigree of ‘Prime-Ark® Traveler’ ? ‘Prime-Ark® Traveler’ resulted from a cross of A-2293T × APF-49T, two Arkansas breeding program selections. Pedigree records go back as far as seven more generations. A-2293T was derived from ‘Prime-Jan®’ and another A-series selection, both with similar ancestry involving named cultivars Arapaho, Brazos, Cherokee, Comanche, Darrow, Hillquist, Navajo, Rosborough, Shaffer Tree, Well’s Beauty, and Thornfree. APF-49T has ‘Prime-Jim®’ and another A-series selection as its parents, with a very similar ancestry to A-2293T. Inbreeding was exploited in this pedigree to obtain the recessive attributes of primocane fruiting and thornlessness in this tetraploid crop. The double recessives took time to achieve, coupled with the quantitatively expressed attributes of postharvest storage potential, good fruit quality, and productive plants. The female parent, A2293T had two alleles for primocane fruiting and also had quality derived from floricane-fruiting parents. The male parent, APF-49T was thornless and primocane-fruiting but had small fruit size and limited yield potential. What is the size of the family from which ‘Prime-Ark®Traveler’ was selected? The original plant was selected in June 2008 from a population of 619 plants in a seedling field during evaluation of floricane fruits. The large population size was needed to achieve the combination of targeted attributes from the two parents. ‘Prime-Ark® Traveler’ is the only commercial release from this population. Will this cultivar be used in RosBREED and how? It is a parent of one of the populations targeted for use in the blackberry research for fruit quality in the current RosBREED project. When will this cultivar be in the market? Released in late 2014, it will begin being sold and planted in the fall of 2015. Are there other primocane-fruiting cultivars? Yes, this is the fifth public release from the University of Arkansas of the primocane-fruiting type plant. The most pop-ular is ‘Prime-Ark® 45’, due to its high productivity, large berry, and high quality; it is thorny, however – a disadvantage in production. ‘SnapDragon’ is a very precocious, productive tree. Fruits have exceptional quality, with crisp texture, good juiciness, high soluble solids concentration, and pleasant aromatic flavors. It has had excellent consumer response. The cross was made in 1998. The seedling first fruited four years later and trees were immediately propagated for both testing at Cornell and then for grower trials. 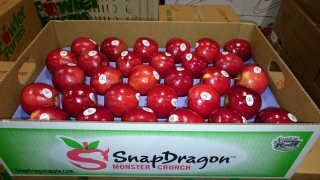 Fast-tracking this selection enabled us to go from cross to negotiating commercialization rights in 11 years – one of the fastest times for an apple cultivar to be commercialized. What is the pedigree of ‘SnapDragon™’? ‘Honeycrisp’ × a NY advanced selection that has quality similar to ‘Jonagold’ but is diploid. This advanced selection is from ‘Starkspur Golden Delicious’ × another NY advanced selection from ‘Monroe’ × ‘Melrose’. What is the size of the family from which ‘SnapDragon™’ was selected? This cultivar was from a cross of 381 seedlings, which is a small family size. There are several more selections from this cross that have commercial potential. This cultivar has been phenotyped and genotyped, along with its ancestors and some of its sister seedlings. These evaluations will help identify and validate the genetic factors responsible for the various exceptional characteristics of ‘SnapDragon’ that enabled it to be commercially viable. Knowing the origin and tracking the inheritance of these factors will aid the development of increasingly exceptional cultivars. This cultivar was the first tree in a long row and when we sampled it at the start of our evaluations I teased my assistant that we couldn’t select the first tree in the row. We noted it, went back again, and quickly decided that it was special and it would be propagated on a fairly large scale the first year of testing, (which is unusual). The highest compliments I received about this apple were from a 90-year-old apple grower who declared it “the best apple I have ever eaten” and a 4-year-old who declared it the “bestest apple ever!” High praise indeed, from both ends of the age and experience spectrum. Dr. John R. Clark describes the features of Prime-Ark® Traveler, the latest primocane-fruiting blackberry from the University of Arkansas System Division of Agriculture fruit breeding program.